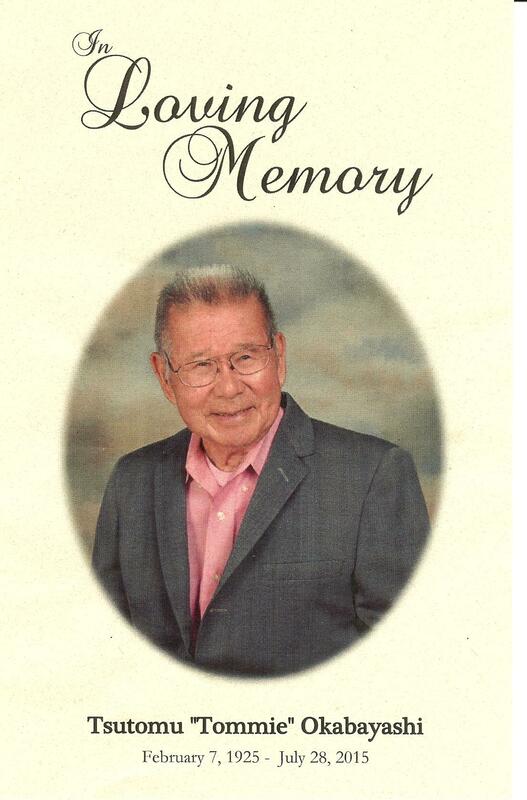 Tsutomu "Tommie" Okabayashi, born in Hamshire, Texas on February 7, 1925 passed away July 28, 2015. He was preceded in death by his wife, Helen Okabayashi; lifelong friend, Shizuko Reeves; his parents, Minoru and Yoshimi Okabayashi; his sisters, Shidu Oyama and Midori Onishi; and brothers, Hiroshi, Kaoru, and Kiyoshi Okabayashi. Tommie is survived by his daughters, Emily Cribb and Shirley Cassell; his sons, Harry and Danny Okabayashi; sisters, Tsuyu Oyama and Kazuko Morrison; brother, George Okabayashi; 7 grandchildren; 11 great-grandchildren; numerous nieces, nephews and extended family. Tommie grew up on the north side of Houston, graduating from Marrs High School (later named Aldine High School) in 1942. He volunteered for the Army in 1943, training at Camp Shelby, Mississippi in the all Japanese-American unit, the 442nd Regimental Combat Team. Fighting in Italy and France during WWII, his unit became the most decorated unit in Army history. Tommie is a recipient of the Bronze Medal, French Legion of Honor Award and the. Congressional Gold Medal. In February 2014, Tommie and 6 other Japanese-American Veterans were honored by President Obama for their contributions during WWII in a ceremony held in The White House Oval Office. He farmed in north Houston with his family, later became a union brick mason and worked in the auto repair business with his brother, retiring in 2011. Tommie was a family man who never missed a birthday party, a wedding or the opportunity to visit his children, grandchildren and great-grandchildren. He was an avid bowler throughout his life and finished his latest league in May 2015 with his son, daughter, two of his grandsons, his son-in-law and a close family friend by his side. Everyone Tommie met considered him a good friend and he will be missed by all.